In 2005 my husband and I moved from Newcastle to Melbourne with our two year old son Lucien. I was 15 weeks pregnant with our daughter Charlotte at the time. We chose to live in Coburg North, near Merlynston. We made this decision because being able to easily access the train to the city was a priority. Affordability of a house was also a consideration. As I don’t drive, living near a gorgeous little village like Merlynston and being able to shop in Coburg but live in a quiet street was a plus as well. Over time we made connections in our community through playgroup, swimming lessons and the various other activities I did with the kids. I began to find my way around and figure out how to get where I needed to be via public transport. 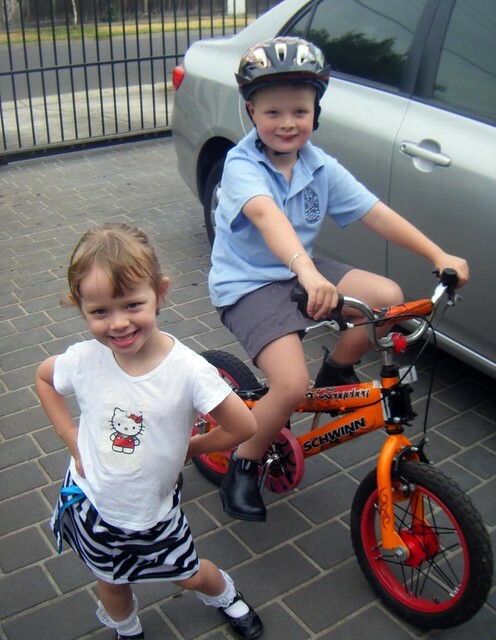 In 2009 Lucien started school at St Mark’s in Fawkner, Charlotte will start in 2011. When Lucien started school we began to think about where he would go to high school. While he is currently going to a Catholic school, this is because it is the best school close to us, also it is a small school as opposed to our family following a religious belief. We do not want to send our son to John Fawkner. That school has been rebranded but I am still yet to hear anything good about it. He will not get in to Brunswick as we live north of Bell Street. Northcote/Thornbury or Northland- well they are just too hard to get to by public transport. Parade- it’s just too far away, plus I have heard it is a big school over over 600 boys. Penola- again just too hard to get to by public transport. Recently Lucien was diagnosed with mild Asperger’s syndrome. He is very smart but a bit socially awkward. I do not want him going to a big school where he gets overlooked or branded a ‘troublemaker’ because there are not resources to give him a bit of extra support. My husband wants us to move to the Strathmore zone. I cannot justify buying a house that in 5 year’s time ‘might’ be in a position to get him into Strathmore. I also do not want to leave our community, our friends, our lovely parks. I do not want to be in a position of being uprooted again and having to learn where things are and how to get around and do all the things I need to. If he goes to a school that is far away, I am worried that if something happens to Lucien at school I would not be able to get there quickly. This issue is a hot topic at our playgroup. One mother said to me recently that her family is considering SELLING their home in Coburg North and then RENTING in Parkville so her daughter (currently in year 3) can go to a decent high school. This is not acceptable. People should not have to sell their homes just so their kids can go to school. So many houses are being sold around our area and then subdivided into two, three, even four lots. More and more young families are moving into the subdivisions of Pentridge, with more to come when the former Kodak site is built on. It is ridiculous we do not have a high school in Coburg for our kids to go to. Traci Stubbs has been following and supporting the High School for Coburg campaign via our Facebook page. Are you on Facebook? We'd love to have you and your friends join us! If you would like to share your family's thoughts on secondary education in the Coburg area, please contact us here.